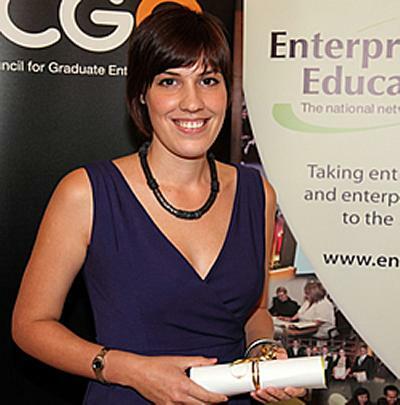 Helena Schulze, the University of Southampton’s Student Enterprise Officer, has been named the UK’s ‘Enterprise Champion’ at the National Enterprise Educator Awards. Helena was the overall winner of the ‘Enterprise Champions’ category in recognition of her outstanding work in raising the profile of enterprise to students and staff and providing opportunities for students to develop their entrepreneurial skills. She also won the UK University Advisor of the Year award at the Students in Free Enterprise (SIFE) competition earlier this year. The University had further success at the awards with the Students in Free Enterprise (SIFE) team ‘Highly Commended’ and Fish on Toast, the University’s student enterprise society, ‘Commended’ in the Student Educators Award category. In total, the University of Southampton won a third of the awards available. Run by Enterprise Educators UK and the National Council for Graduate Entrepreneurship (NCGE), the awards aim to nationally recognise and celebrate the achievements of those striving to create entrepreneurial outcomes in others in universities. The awards were announced at the International Entrepreneurship Educators Conference (IEEC) in Cardiff last week. Established for just two years, SIFE Southampton has already had considerable success, finishing third in the UK-wide SIFE competition earlier this year. Being highly commended is a reflection of the fact that they doubled their membership, created sustainable and self-funding business projects and made £13,000 profit, which has been invested back into a number of social projects. The annual SIFE competition challenges students globally to create enterprises that are ethical, sustainable and improve people’s quality of life both locally and around the world. Fish on Toast has also had a great year, considerably raising the profile of the society by engaging with a much wider audience of students. Functioning in a professional and business like way, they have raised a large amount of corporate sponsorship to fund their activities.